From our postbag we know that innumerable kind-hearted people knit my dolls and toys to raise much needed funds for charity and other worthwhile causes. 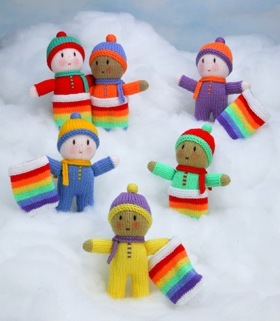 With this charity aspect in mind I have designed The Rainbow Babies as the first new and exclusive free pattern on our website. Ideal as fund-raisers, these sweet Babies are quick to knit and each one only requires 25 grams [less than 1 ounce] of yarn and the same amount of stuffing. The doll measures just 17cm [6¾ in] high without the cap. The feet, legs, body and head are knitted in one piece and the ‘babygrow’ garment is part of the doll. The only separately knitted pieces are the arms, cap and scarf. You can make pink or brown Babies, but be sure to choose lovely bright colours for the rest of the design, in keeping with the rainbow theme. For extra play value I have also included a cosy rainbow pocket. Popped inside the pocket, every doll becomes part of the RAINBOW! The pocket measures 8cm by 9cm [3in by 3½in]. With your help I hope the Babies will create a beautiful RAINBOW all around the world. This quartet of ghostly funsters like to haunt in style. Not for them those old white bed sheets - each one is a spooky hoot. Lady Lavender is famous for her lilac ensemble and for delightful afternoon tea parties, where she entertains the other three Ghostlys with cucumber sandwiches, dainty cakes and a tune on the harp. Moping Mona and her Kitty-Cat make a flourish in fluorescent green. Mona only pretends to be a moaner so that everyone will go ‘Ahh’ and give her lots of cuddles, not forgetting Kitty, who also likes to look sad so he too can enjoy lots of tickles. Bertram Spookalot-Smythe dons grey apparel as befits a thespian fond of Shakespearian tragedy. Obviously the audience gives him a standing ovation for his performance with the huge ball and chain. Foghorn Fred is the noisy one. He likes to appear in bright yellow and his midnight ‘WOOO-OOO’s can be heard from the dungeon to the ramparts. It’s no wonder that his wee Pumpkin friend looks bewildered −‘What’s it all about’? The Basic figure and all the other pieces are simple rectangles or strips, knitted in garter stitch. Each character measures about 8cm [3in] in height and they all stand up on cardboard bases. Only oddments of yarn are required and small amounts of stuffing. 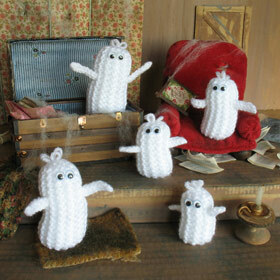 Click here to download the Meet the Ghostlys free pattern. Here are two little charmers – Molly in a red dress and Lucy in a yellow dress. Both are knitted from the same pattern and measure 17cm [6¾in] in height. No doubt little girls will love these sweet dollies and they are also perfect for those wonderful knitters who raise funds for charity. 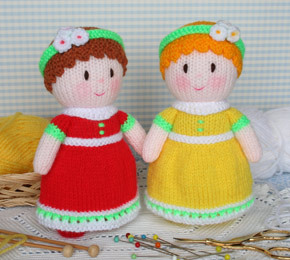 Click here to download the Dainty Dollies free pattern. Say hello to the Nittybod family from Nittyland – Daddy, Mummy, Tweenager, Toddler and Baby Twins. 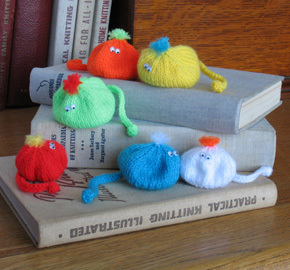 You can have lots of fun knitting these little creatures using up all those tiny scraps of left-over yarn. Glue on melon seed eyes, add grape stalk arms and pointy head bits and they turn into comical characters. It’s amazing how so many different expressions are possible using throw-away materials! Easy-peasy to knit – just garter stitch strips, the Nittybods can be made as mini mascots to amuse your family and friends. Daddy measures 6cm [2½in] high, Baby Twins just 2.5cm [1in] and the other sizes are in-between. Click here to download the Nittybods free pattern. These colourful bean bag characters can be squished and squashed into dozens of different poses. Knit them as comical desk top toys or computer mascots to amuse the grown-ups and they will happily double-up as useful paperweights. They are also good for throw and catch games and learning how to juggle. Instructions are included for making three sizes from one simple basic pattern, the only variations are in the number of knitted rows. When squashed flat to form a smooth circular shape the bugs measure 5cm [2in], 6cm [2⅜in] and 7cm [2¾in] across the centre. The plastic granule 'beans' are safely secured within the knitted pieces in a gathered circle of fabric. Only bits of yarn are required and all the bugs can be knitted up very quickly. Who could resist those bobbly tails! Click here to download the Squidgy Beanbugs free pattern. Previously known as the ‘cup and ball’ game. Amazingly, this entertaining toy has been a favourite among children and adults for centuries. The traditional version is usually made out of wood, with a stick handle and a cup on top. The ball is tied to the stick and with a swinging movement the ball is thrown upwards. The aim is to catch the ball in the cup. In my 21st century version, the balls are comical knitted Birdie characters. It requires dexterity, eye-to-hand co-ordination and practice to catch the ball in the cup. The game rules – to see how many catches there are in a set number of throws by opponents. The basic cups are made from the cardboard tubes which are inside kitchen paper towel rolls. Decorated with coloured paper and trimmed with knitted pieces, the toys make amusing presents for youngsters and grown-ups alike. There are two versions in Christmassy colours, great for stocking-fillers – and two more suggesting alternative colour schemes. Enjoy making these novelties and then join in the fun – you won’t be able to resist! The cups measure just over 5cm [2in] across the diameter and the balls measure about 2.5cm [1in] across the diameter. 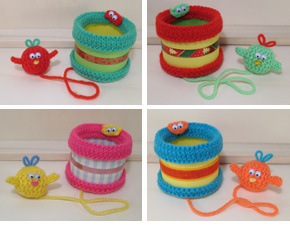 Click here to download the Cup & Birdie Game free pattern. Knit these versatile characters as comical ornaments perched on their plump pebbles, or colourful mascots for the family car. The boy version is also suitable for sports fans, simply knit the scarf and hat in the required team colours. Both stand up on their tootsies, then sit down flat, making amusing toys for the children. Worked mostly in garter stitch on 4mm [No 8, USA 6] needles, they knit up quickly from oddments of double knitting yarn. Each one measures 14cm [5½in] from the toes to tops of the cap bobbles. 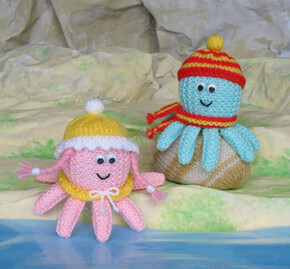 Click here to download the Jolly Octopuses free pattern. These little characters are all based upon the easiest of patterns. The main piece is just a garter stitch tube, with one half pushed inside the other half. This double knitted thickness and the stretchiness of garter stitch holds a chocolate egg securely in place, until it is squeezed out. The addition of wings, ears etc transform the main piece into four versions – Chick, Duck, Bunny and Mouse. From our postbag we know that knitters are always looking for simple Easter patterns, so I’m sure these designs will be very popular. The main piece with egg inside measures 6cm [2⅜in] from the base to the top end and only bits of yarn are required. Click here to download the Easter Egg Treats free pattern. Introducing William, the cute and cuddly knitted Snowman. It's guaranteed that the children will love him to bits and no doubt he will find a home in the toybox instead of being stored away in the Christmas box. I'm sure that knitters will also enjoy his company, re-creating lots of Williams all year round. Real life snowmen are fun for a while, but they always melt away. William is a friend forever and a snowman for all seasons. I can never resist giving my dolls rosy cheeks - including snowmen! William measures 24cm [9½in] high, not including the bobble on his cap and only small amounts of yarn and stuffing are required. 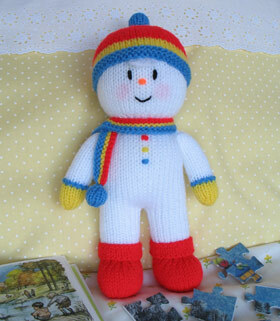 Click here to download the Toybox Snowman free pattern. 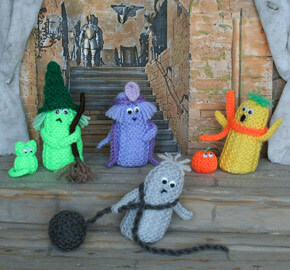 This quintet of cute characters couldn't be quicker or easier to make from scraps of yarn and stuffing. They are knitted in garter stitch (no increases or decreases) and with one nifty stitch they stand up by themselves, like magic! Moreover, children can join in the knitting. The smallest size only has 12 stitches and 19 rows and they are all worked on 4mm [No 8, USA 6] knitting needles - perfect for beginner knitters, grown-ups included. Even the arms are easy-peasy, just one cast on/cast off piece, which is threaded through the body. There are instructions for five sizes ranging from 4.5cm [1¾in] to 7.5cm [3in] in height. You can knit them all year round, providing lots of amusing treats for the 31st of October. Click here to download the Halloween Ghosties free pattern. These amusing eggs-in-egg-cups have a dual purpose. The basic pattern is a pocket, designed to hold a small chocolate Easter egg. Guaranteed to please youngsters and oldies alike, the pocket turns an inexpensive sweet treat into something special. 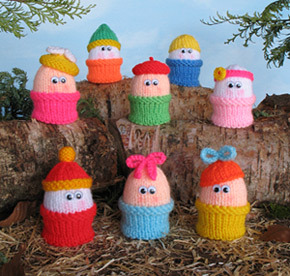 The pattern includes instructions for a knitted egg. This also fits snugly inside the pocket, which transforms these whimsical characters into all-year-round mascots or miniature keepsakes. In addition, there are patterns for cute hats and headwear, eight different versions, so you will be spoilt for choice. Only requiring scraps of yarn these designs can be knitted up in no time at all, perfect for quick gifts and charity fund-raising. The basic design measures 6cm (2⅜in) in height, without the hats etc. 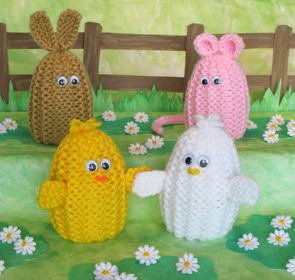 Click here to download the Novelty Eggs free pattern. These charming Christmas stockings are quick and easy to make and they can be used in a variety of ways. Here are some suggestions. Stuff them softly for tree decorations or add some small candies to please the children. Enclose two or three luxury chocolates for your party guests, then attach a small name card and they turn into novelty place markers. Filled with small fabric bags of lavender, they make sweet scented sachets – delightful as gifts or for charity fund-raising. Instead of the usual gift box, use a stocking as the ‘gift wrapping’ for a small present, such as jewellery. Or simply hang some on a cord for Christmas bunting. 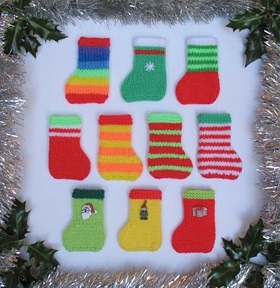 Each stocking only requires 5 grams [less than ¼ ounce] of yarn and measures 8.5cm [about 3¼in] in length. Click here to download the Christmas Stockings free pattern. I hope you had fun with the Jiffyknit Appetisers and here is Part Two of the Party Treats, scrumptious Biscuits and Cakes to amuse your tea-time guests, while serving up the edible bakes. This is how Jiffyknits began. In the late 1980s I developed a proposal for a hardback book of easy items for children to knit. This was set aside for a few years and when I returned to the project I completely changed tack. Because everyone learns to knit making garter stitch strips I decided to challenge myself - how many ideas could I come up with for making amazing and amusing things from garter stitch pieces? No increasing or decreasing allowed - just straight strips. It turned into a marathon and Jiffyknits is the result which we published in 2000. I enjoyed creating these simple knits so much that I'm still producing new designs. And it seems unlikely that I'll ever get to the end of so many intriguing possibilities. Click here to download the Tea Party Treats Part Two free pattern. After Jiffyknits was published in 2000 I had many more ideas for garter stitch strips and now have a file packed with new projects. Here are some of these unpublished goodies for you to download as free patterns. Part One of the Party Treats features the Appetisers, yummy savoury finger food. Many hostesses have entertained their guests by first serving up the Jiffyknits sandwiches, cakes and biscuits for afternoon tea. 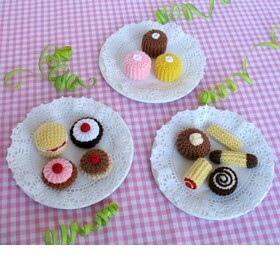 This caused much amusement because obviously knitted food is simply hilarious! If you haven’t already discovered these delights visit the Jiffyknits pages on our website to find a cornucopia of garter stitch creations. For those of you who are already Jiffyknitting, these new party treats can be added to your recipe book. 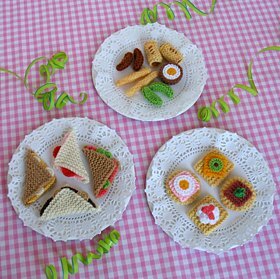 Click here to download the Tea Party Treats Part One free pattern. This trio of comical characters are created from small garter stitch rectangles, bits of stuffing, cardboard, wiggle eyes and glue. No doubt they will be very popular with youngsters and maybe grown-ups as well! All the pieces are quick and easy to knit on 4mm [No 8, USA 6] needles. Big measures 7cm [2¾in] high from the base to top of the body. Little measures 5cm [2in] high from the base to top of the body. Tiny measures 3.5cm [1⅜in] high from the base to top of the body. Click here to download the Robots free pattern.